For me, an important part of being a cardiologist has always been listening for the bits of information patients share about their lives that aren’t related to their heart issues. Their relationships with family and friends…their worries…their joys…and, naturally, their other health concerns. Those insights always helped me understand how to give these folks the best possible care. One of the most common complaints I heard was about chronic pain. Usually I followed up with questions about the person’s home environment. Were they often stressed? Did they have someone to help with daily tasks? Did they have any pets? My question about pets was almost always met with instant smiles from those with dogs and cats. Many people eagerly told me about their animal companions and how much of a comfort they were during difficult pain episodes. And years later, when I was dealing with the chronic pain that eventually led to hip replacement surgery, I came to better appreciate the power pets have to make our lives better. My dogs, Chewie and Kuma, brought me a lot of joy and peace during that time, and ultimately helped me cope with the pain – I’d take them over NSAIDs (and certainly over opiates) any day! If I knew during my practice what I know now, I surely would have been recommending not just pets, but service dogs, as a way for patients to help manage pain. Chewie was like a big teddy bear. She loved the attention from my staff and patients, and my patients loved getting a chance to say hello. Even the sickest of them would light up when they petted her. Chewie wasn’t a service dog, though. She was more like an emotional support dog. Support dogs are socialized to provide comfort in situations people find unusually stressful. My daughter, for example, has a good friend who suffers from PTSD*. Her support dog helps her spend time in public spaces that you and I wouldn’t think twice about, but for her can be a dangerous trigger. Support dogs also provide therapy in hospitals and nursing homes. Service dogs, on the other hand, are less of a pet and more of a caretaker. They go through extensive training and learn how to perform tasks that you may not be able to—things like providing additional balance, pulling a wheelchair, picking up things you drop, and seeking assistance if you need help. They also learn to follow commands, either verbal or hand gestures, and to basically act as an extension of their owner. Most importantly, while service dogs are “working,” you can’t interact with them like a normal dog or you risk distracting them from all of the important cues they’re paying attention to. Legally, service dogs also have rights that support dogs don’t. The Americans with Disabilities Act allows service dogs to accompany their owners into any public space, including retail stores, physician offices, grocery stores, and restaurants. For people with significant chronic pain, service dogs can be a godsend. Say you have trouble bending down due to arthritis or sciatica. With back trouble like that, even something as simple as getting the morning paper can be an ordeal. But with a service dog, you could have the animal pick it up for you and place it on a table where it’s easier for you to reach, or in your hand. The same goes for containers, clothing—anything on the ground, really. Or maybe you need to use a wheelchair to get around. A service dog can do things like help push crosswalk buttons for you, which is helpful in general but can also prevent movements that cause flare-ups of your pain. Research supports the use of service dogs to help manage pain, too. One study in particular, showed that people have less shoulder pain when service dogs pull manually operated wheelchairs, and that they are able to travel more and take more pleasure in social settings. Thanks to their service dogs, many of the individuals who participated in the study were able to return to a more normal life. Even if you don’t need a full-fledged service dog, adopting a calm, well-adjusted dog can help reduce pain. The simple act of petting a dog can release endorphins in the brain, which soothe pain. The gentle cardiovascular activity of walking a dog is good for you, too. Not only does it get your blood flowing, but it forces you to move stiff joints and muscles, which (though counterintuitive) is one of the best ways to manage pain. Above and beyond managing pain, service dogs also have a remarkable ability to detect health issues. It’s not uncommon, for example, to experience certain symptoms in advance of a flare-up of a problem. Migraine headaches are a good example. Many people know one is coming if they feel a certain type of pain, mood swings, food cravings, or other changes in how their bodies normally work. Service dogs can be trained to watch for changes in your behavior that indicate you’re likely to have a problem soon. Dogs can also monitor your balance and help brace you against a wall or table if you seem overly wobbly and headed for a fall. If you think a service or support dog could help improve your quality of life, talk to your doctor or your local animal shelter to find out where the nearest trainer is and how you can get on their list. Another option is getting in touch with the Foundation for Service Dog Support. The one drawback of these dogs is their cost, which due to breeding and training can be significant. Whether you have a service dog, support dog, or a family dog like Chewie, make it a top priority to give them the best care you can. With all they do to keep you happy and healthy, why not do the same for them? 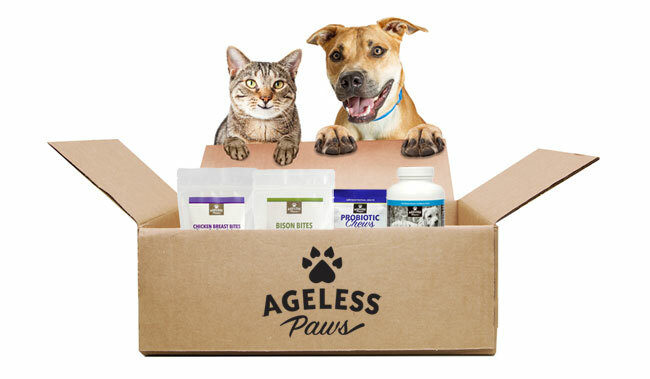 Helping you with that is why I started Ageless Paws. Here, at AP, I’m using everything I’ve learned helping humans for 40 years to source pet products that will help your dog live better, longer, and happier. Don’t worry, I’m working with a veterinarian who approves everything that goes into our store—things like premium, high-vibrational treats, gear, and toys, along with pet-specific nutritional supplements that can help reinforce your dog’s diet, just like you do yours. I hope you’ll bookmark this site as your go-to source for managing your dog’s health in the same way you manage your own. After all, you both deserve the best! *People with PTSD who have task-specific needs are also eligible for service dogs. Foundation for Service Dog Support, Inc.
Foundation for Service Dog Support, Inc. Service dogs. Accessed September 21, 2017. Gibeault S. Everything you need to know about emotional support animals. American Kennel Club. Accessed September 21, 2017. Herzog, H. Can dogs warn their owners of impending migraines? Psychology Today. 16 Jun 2014. Accessed September 21, 2017. Hubert G. Effect of service dogs on manual wheelchair users with spinal cord injury: a pilot study. J Rehabil Res Dev. 2013;50(3):341–50. Lenox Smith E. The advantages of having a service dog. Pain News Network. Accessed September 21, 2017. National Fibromyalgia and Chronic Pain Association. Animal assisted therapy. Accessed September 21, 2017. © 2017 HeartMD Institute and Vervana. All rights reserved.